Humboldt Fog is a goat milk cheese made by Cypress Grove, of Arcata, California, in Humboldt County. It is named for the local ocean fog which rolls in from Humboldt Bay. Humboldt Fog is a mold-ripened cheese with a central line of edible white ash much like Morbier. The cheese ripens starting with the bloomy mold exterior, resulting in a core of fresh goat cheese surrounded by a runny shell. As the cheese matures, more of the originally crumbly core is converted to a soft-ripened texture. The bloomy mold and ash rind are edible but fairly tasteless. The cheese is creamy, light, and mildly acidic with a stronger flavor near the rind. Camembert is a moist, soft, creamy, surface-ripened cow's milk cheese. It was first made in the late 18th century at Camembert, Normandy, in northern France. The first camembert was made from unpasteurized milk, and the AOC variety "Camembert de Normandie" is required by law to be made only with unpasteurized milk. Many modern cheesemakers, however, use pasteurized milk for reasons of safety, compliance with regulations, or convenience. Beekeepers may remove the entire honeycomb to harvest honey. Honey bees consume about 8.4 lb of honey to secrete 1 lb of wax, so it makes economic sense to return the wax to the hive after harvesting the honey. The structure of the comb may be left basically intact when honey is extracted from it by uncapping and spinning in a centrifugal machine—the honey extractor. The almond is a species of tree native to Mediterranean climate regions of the Middle East, from Syria and Turkey to Pakistan, although it has been introduced elsewhere. Almond is also the name of the edible and widely cultivated seed of this tree. Within the genus Prunus, it is classified with the peach in the subgenus Amygdalus, distinguished from the other subgenera by corrugations on the shell (endocarp) surrounding the seed. Manchego is a cheese made in the La Mancha region of Spain from the milk of sheep of the manchega breed. Official manchego cheese is to be aged for between 60 days and two years. Manchego has a firm and compact consistency and a buttery texture, and often contains small, unevenly distributed air pockets. The colour of the cheese varies from white to ivory-yellow, and the inedible rind from yellow to brownish-beige. The cheese has a distinctive flavour, well-developed but not too strong, creamy with a slight piquancy, and leaves an aftertaste that is characteristic of sheep's milk. Chaource is a French cheese, originally manufactured in the village of Chaource in the Champagne-Ardenne region. Chaource is a cow's milk cheese, cylindrical in shape at around 10 cm in diameter and 6 cm in height, weighing either 250 or 450 g. The central pâte is soft, creamy in colour, and slightly crumbly, and is surrounded by a white Penicillium candidum rind. 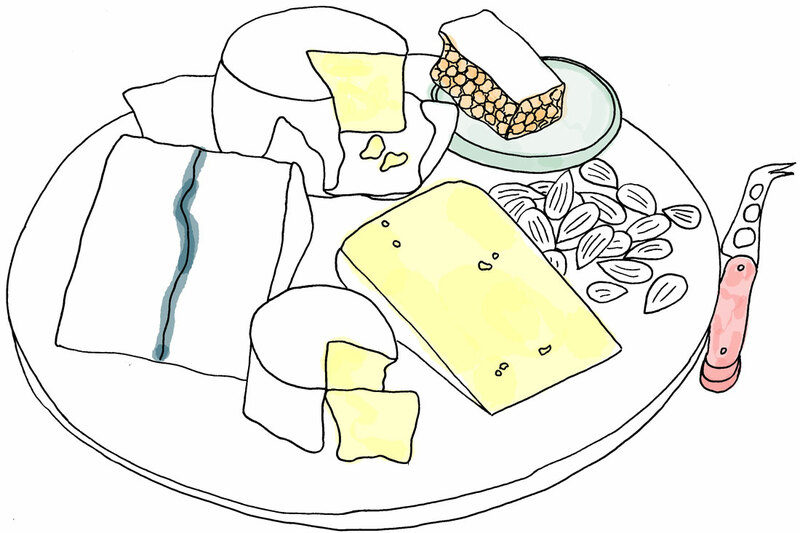 Click on each item on the cheese plate to learn a bit more about it. The associated information is shown in a lightbox.